Many modern homes incorporate some type of great room and loft to create an open feel to the living space. 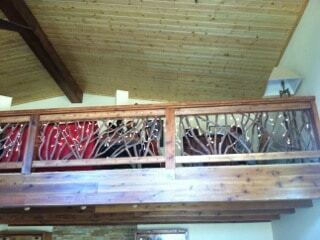 This means that there is often a balcony railing that is prominent in the great room or living area. 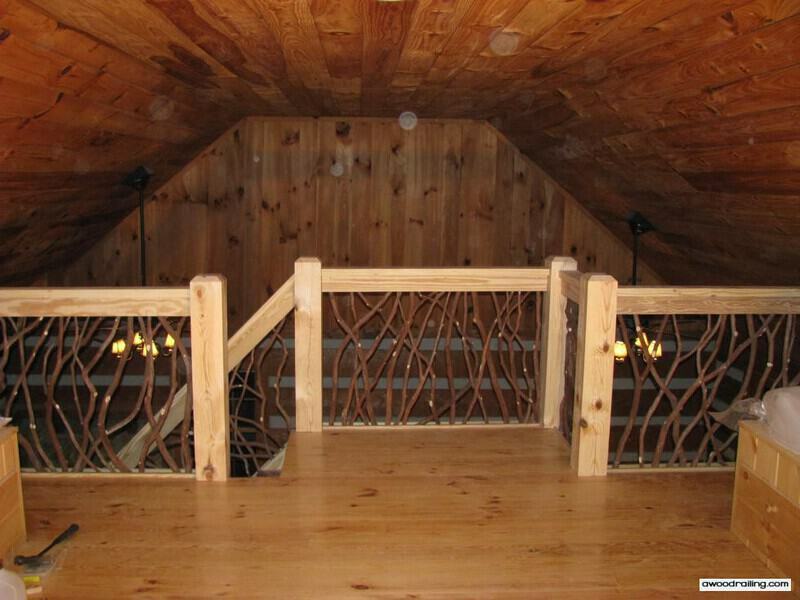 Take your time selecting the railing idea that is right for you. The balcony handrail is an architectural element of a home’s interior design that is often overlooked by designer, builder and homeowner. The staircase leading up is often one of the very first pieces of the home that a new visitor will see. It is important to make a strong statement with these architectural elements that will dazzle viewers. 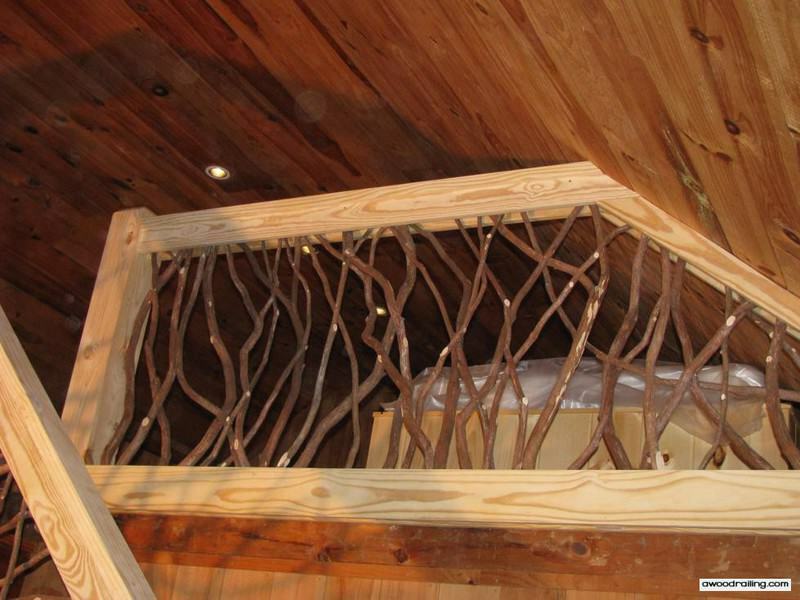 Mountain Laurel Handrails use natural wood balusters to create wondrous designs from branches that have grown into a variety of shapes. This design incorporates a balcony handrail which connects with the stair railing and leads into the cathedral ceiling. Your architectural selections makes a strong statement about design choices and interior stair railing kits from us are a great choice! In many homes, the staircase is the most visible architectural element inside the home. As it rises from floor to floor, the viewer’s eye is drawn upward towards the heavens. Often the stairs will be accompanied by a stone or rock fireplace in a great room. This large living space is the central gathering point of a home. Many homes feature a grand staircase as the focal point of a great room. And oftentimes these stairs are finished with precise woodworking. But too often, the stair hand rails get overlooked and the balusters end up as boring pickets or turned spindles going up and down from tread to banister. A thoughtful staircase design acknowledges that an intricate and beautiful balustrade is the most important factor in the look of a stairway. The stairs lead up to a balcony where the handrail of the stairs continues. Many formal designs feature vertical balusters that are evenly spaced. Sometimes these wood balusters will be turned with designs seemingly carved into them. 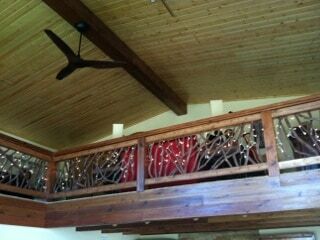 These pictures show of how the staircase and balcony is the centerpiece of the great room. The front door to this home is located at the foot of the stair, so as visitors enter, they are greeted with the sight of these interesting features. The staircase design draws the eye upward toward the balcony handrail and then further into the room where the viewer is greeted by cathedral ceilings and tongue-in-groove pine boards. The use of similar colors on the lower and upper levels also adds to the visual excitement and ties the room together. The first thing you see as you enter this home is the stair railing and it leads to the balcony handrail which is also made in the same style. The tongue and groove lumber on the cathedral ceiling required expert woodworking precision to ensure a close fit. Take a close look at the pictures and you’ll see all the special modifications that the carpenters made to produce quality finished work. Balcony handrail design, just like most parts of a home or new construction, are governed by different code regulations. These code requirements are set in most places by the building code produced by the International Code Council. These requirements are then adopted and modified by local jurisdictions. The handrail height code in most places is between 36″ and 42″. 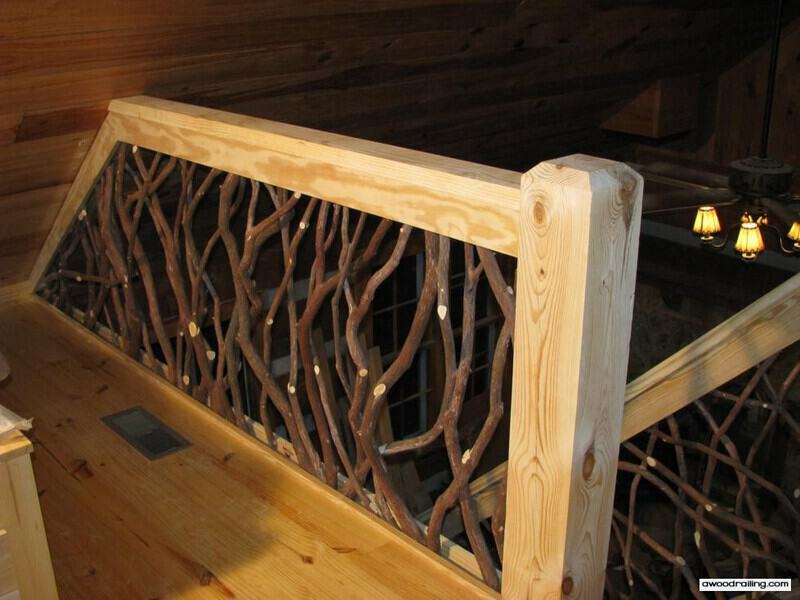 The balcony handrail system provided by Mountain Laurel Handrails comes in sections that are typically 31″ tall. With a 3.5″ space from the finish floor and a 1.5″ thick board on the top, the finish height is 36″. If you want something taller than this, just let us know. The homeowner liked the look of yellow pine lumber and they already had a lot of wood in the home which made this rustic stair railing the crowning jewel in this home. Many homes incorporate different kinds of wood and it’s important to keep everything in a home matching nicely. This can be a tricky proposition in either new construction or remodeling. 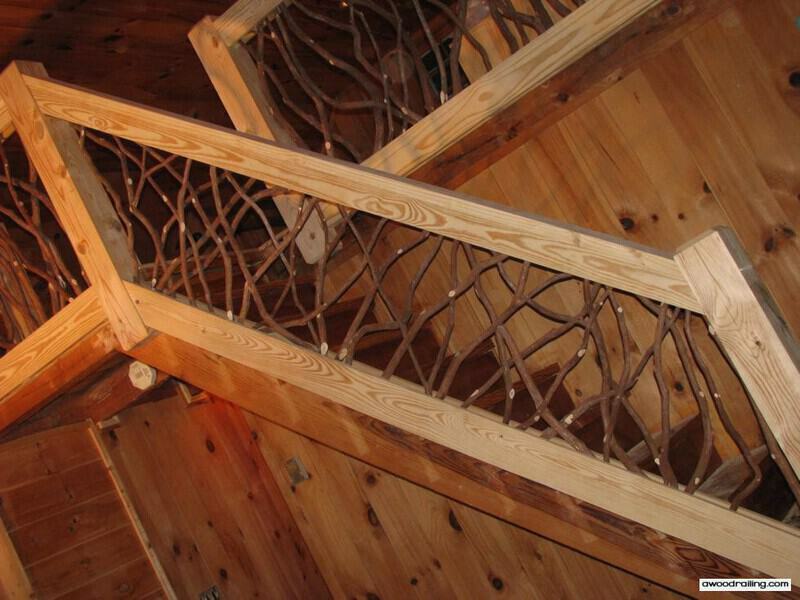 Other material options include wrought iron , glass panels or balusters, regular wood balusters made of 2×2 boards. Our master carpenters in the workshop can help with some of these choices. Lumber is one of the most common modifications to an order as homeowners and contractors try to match the new or existing lumber. This yellow pine option installed in a log home remodel in the North Georgia mountains shows how keeping the lumber palette limited can blend the whole project together for great final results. There is great diversity in the different lumber species. Even cutting the same tree in different ways results in wood that looks differently. 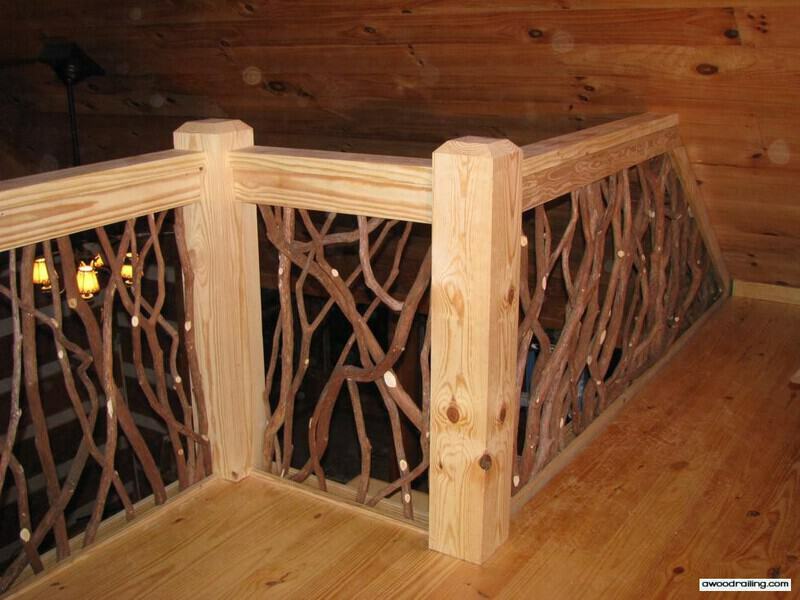 The typical lumber for Mountain Laurel Handrails is red cedar. This lumber ranges from light pink to dark brown with knots. Clear cedar which has no knots is also available for a premium price. Redwood, which is similar to cedar and is apparently common the West Coast, is quite expensive on the East Coast where it is special order. This handrail installation made this home extra special and unique. 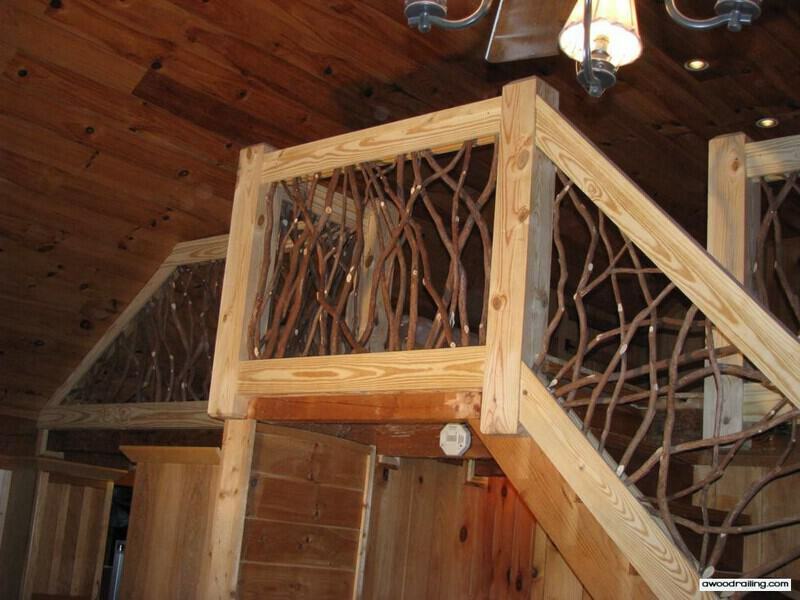 But Mountain Laurel Handrails aren’t the only type of unique stairway railing that is a good match for a mountain home. 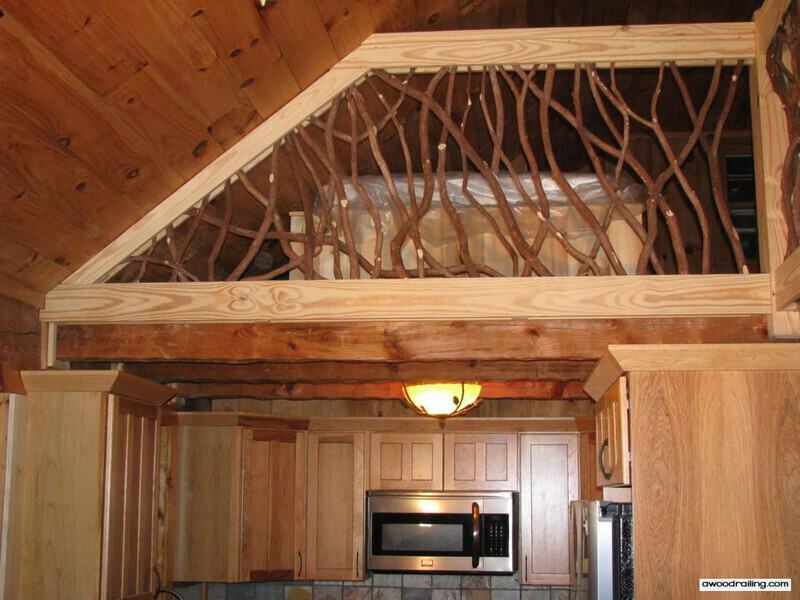 If you’re building a log home, or timber frame, there are a few options. Many homes built in the craftsman style will have strong horizontal elements in the woodwork and intricate, built up columns to create a craftsman motif. Depending on the style that you’re looking for, you’ll have some choices to make. But choosing a bold statement for your inside handrails is sure to make a strong impression! Especially for a log home or a mountain home with lots of wood ceilings and hardwood floors like the one pictured here, natural wood is the perfect match for pine ceilings and hardwood flooring. Contact Today with your project details to get started! This project was installed in a Texas “barndominium”, a large open barn-type building that has been converted for residential use. We worked with the homeowner while this home was still in the beginning construction phase. This close collaboration leads to a well-executed finale. If you have questions or want specific advice on your project, contact us and we’d be happy to help so that your results are just as pleasing as this! Here’s what the homeowner had to say when she sent her pictures of the completed work. Hope these pictures work for you. 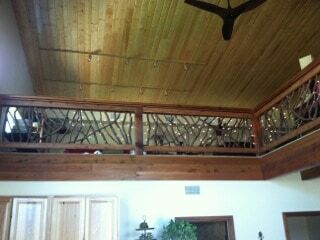 We think the balcony railing adds so much to the Texas barndominium look. We really like them and get many positive comments. Thanks for being so easy to work with through the process. The homeowner decorated with icicle lights for the Christmas holiday. I know that this post is a little late for the holiday season but this is just such a great looking railing. 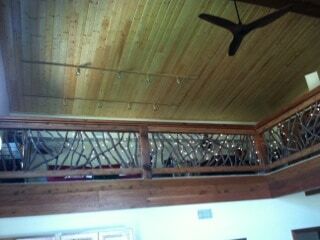 The dark stained beam and handrail opens up to the natural pine tongue and groove ceiling. Those icicle lights add a festive look and the three-blade fan adds a nice touch. The balcony looks like a there’s some furniture set up and lamps for lounging and reading a book or just curling up for a short nap.